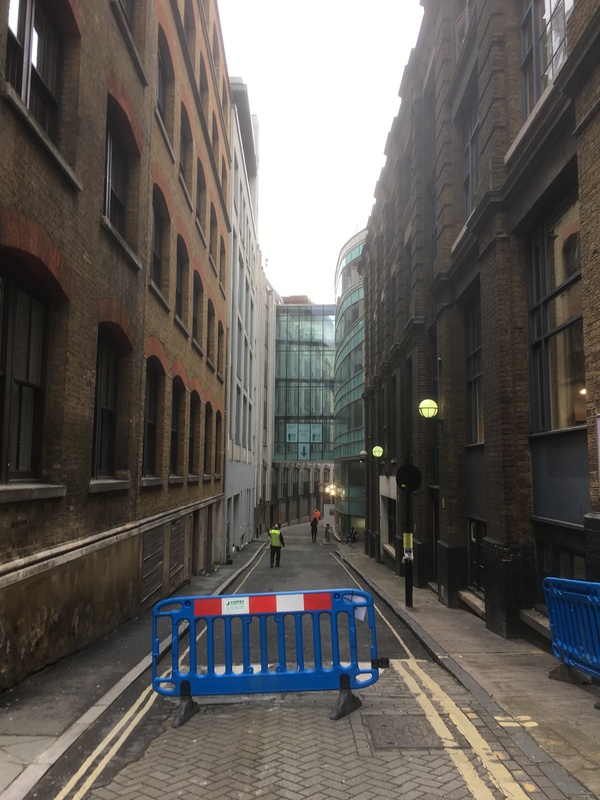 The border between Bloomsbury and Clerkenwell is seamless and invisible but one is instantly aware of passing from a genteel quarter into a raffish one. 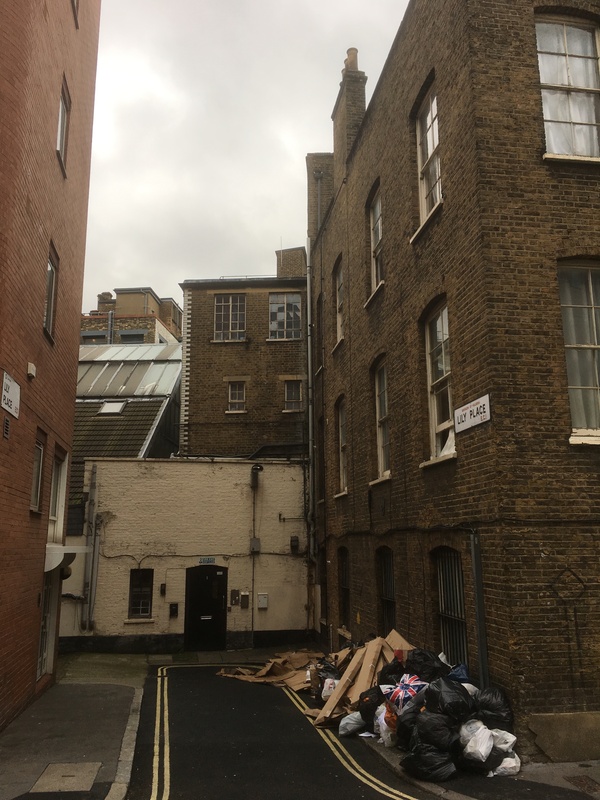 I ventured in that direction last week on a particular quest: to discover one of London’s great literary landmarks, the site of Fagin’s lair. In Dickens’s novel Oliver Twist, begun in 1837, the squalid apartment of the ‘pleasant old gentleman, and his hopeful pupils’, is located with precision on Saffron Hill. Oliver, a bemused and exhausted runaway, has joined up with the Artful Dodger on the Great North Road. That highway, known at the London end as ‘Liverpool Road’, is bordered here by market gardens, by open fields and by the cattle lairs that the drovers use on their way to Smithfield Market. The turnpike by which the boys enter London is hard by the Angel at Islington, an old coaching inn that had been entirely rebuilt in 1819. It is approaching midnight as the pair proceed along St John Street into Clerkenwell, then, by way of Exmouth Street and Coppice Row, to the prettily-named Saffron Hill, ‘along which the Dodger scudded at a rapid pace, directing Oliver to follow close at his heels’. This had once been a country lane through the Bishop of Ely’s estate, where saffron was grown, but since the late seventeenth century it had been developed into an overcrowded and impoverished residential area, a ‘rookery’. Oliver ‘could not help bestowing a few hasty glances on either side of the way as he passed along. A dirtier or more wretched place he had never seen. the street was very narrow and muddy, and the air was impregnated with filthy odours. There were a good many small shops; but the only stock in trade appeared to be heaps of children, who, even at that time of night, were crawling in and out at the doors, or screaming from the inside. The sole places that seemed to prosper amid the general blight of the place were the public-houses, and in them, the lowest orders of Irish (who are generally the lowest orders of anything) were wrangling with might and main. Covered ways and yards, which here and there diverged from the main street, disclosed little knots of houses where drunken men and women were positively wallowing in the filth; and from several of the doorways, great ill-looking fellows were cautiously emerging, bound, to all appearance, upon no very well-disposed or harmless errands. 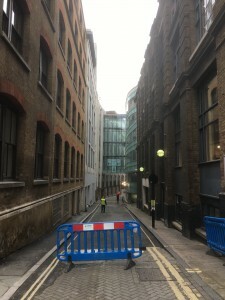 Field Lane was an alley at the south end of Saffron Hill that connected it to Holborn Hill. The name has since disappeared from the map. Dickens knew it well and hardly exaggerates the wretchedness of the place. Peter Cunningham, author of a Hand-book of London, 1850, describes Saffron Hill as a ‘squalid neighbourhood between HOLBORN and CLERKENWELL densely inhabited by poor people and thieves … The clergymen of St Andrew’s, Holborn, (the parish in which the purlieu lies), have been obliged, when visiting it, to be accompanied by policemen in plain clothes.’ Hepworth Dixon in The London Prisons, also published in 1850, writes that Field Lane ‘is narrow enough for [one] to reach across from house to house, and the buildings so lofty that a very bright sun is required to send light to the surface … The stench is awful. Along the middle of the lane runs a gutter, into which every sort of poisonous liquid is poured.’ A foreign observer, Flora Tristan, describes it in 1842 as ‘a little alley … too narrow for vehicles to use,’ where ‘there is absolutely nothing to be seen but dealers in second-hand silk handkerchiefs.’ Intrepid enough to visit at night, she adds: ‘There is a bustle of activity in the street as prostitutes, children, and rogues of every age and condition come to sell their handkerchiefs’ (London Journal, p.175). These had been stolen, of course, by the likes of Fagin’s crew, and the saleswomen, invariably ‘daughters of Israel’, were ‘fences’. Dixon was incensed by their attempts ‘to seduce you into the purchase of the very handkerchief which you had in your pocket at the entrance’ (The London Prisons, pp.227-8). There is a palpably villainous and mournful air to Saffron Hill, which is still oppressively enclosed by tall buildings. The street is paved now, the original houses have all gone, and the River Fleet, a filthy open sewer that ran along its east side, is covered over; but there is a paucity here both of smart offices and of trendy warehouse developments, as if it is still a demoralised place, forsaken by the world and left to its ghosts. 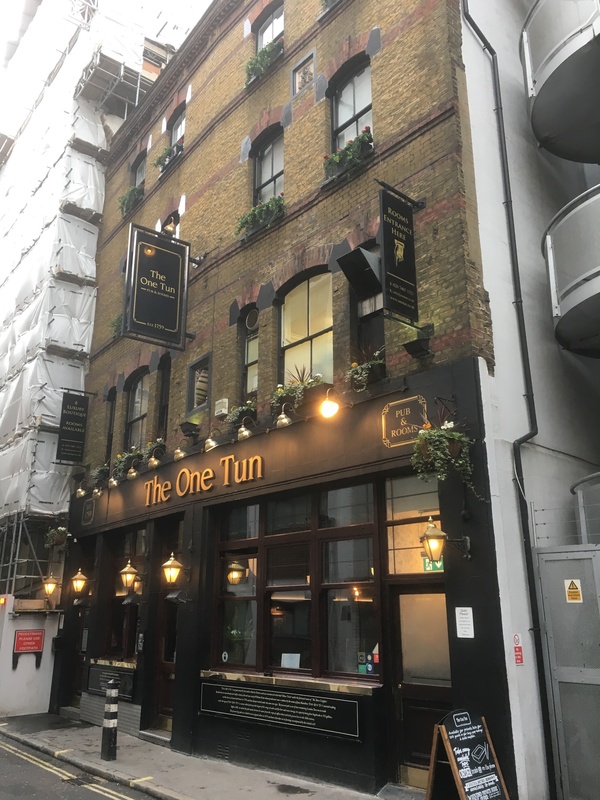 Descending the hill, one passes The One Tun (rebuilt in 1875, over the original cellars), which is claimed, not unreasonably, as the model of the ‘low public-house, situate in the filthiest part of Little Saffron-Hill,’ that Bill Sikes frequents with his dog. It is described as ’a dark and gloomy den, where a flaring gas-light burnt all day in the winter-time, and where no ray of sun ever shone in the summer’. 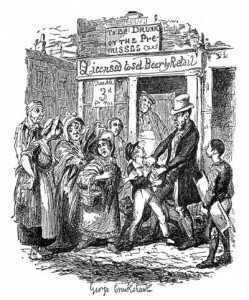 The best editions of Oliver Twist are those accompanied by George Cruikshanks’s original illustrations, where the impoverished, under-nourished boys always appear like old men. Cruikshanks’s illustration of the pub, headed ‘Oliver claimed by his affectionate friends’, shows a doorway festooned with misspelt notices: ‘To be drunk on the premises’; ‘Licensed to sel Beerly Retail’; ‘Fine Ale 3d pr. pot’. At this end of Saffron Hill, one feels trapped and cornered, as if one has descended into a pit. A steep flight of steps leads up into the street beyond and the relief of sunlight and fresh air, or what passes for it in this part of London. Literary pilgrims in search of the authentic Dickensian atmosphere will not be disappointed. Footnote. Halfway down Saffron Hill were the premises of Longman & Co., the publishers, from 1887 – too late to have inspired Fagin’s lair, but the dirty curtains and the piles of rubbish outside evoke Dickensian squalor.